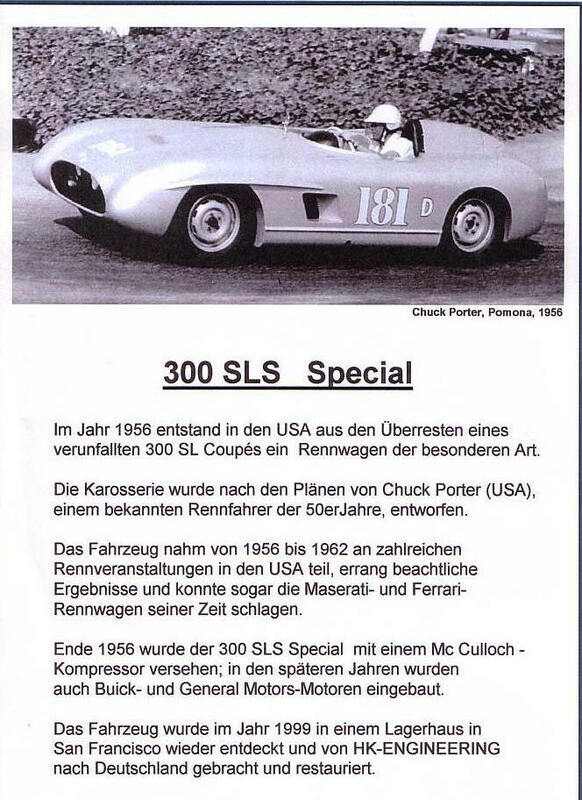 It is nothing short of a miracle that the next series of events even happened.In the 1950’s, my father, Chuck Porter, had a famous race car which he called his “300 SLS”. This car went through a lot of engines and different drivers, and won a lot of races. My father raced it from 1956 to 1959, then sold it. Years went by, my father raised my sister Cathy and I, and had his own body shop in Whittier where he still did custom work for clients, but a lot of his time went toward finding and restoring his beloved antique 3/4 midgets.My father passed away in 1982 while driving in an Old Timer’s race at Indian Dunes. He didn’t suffer, and it’s the way he would have wanted to go. We sold his antique race cars and trucks to collectors to insure that the public would be able to continue to enjoy them. I never knew what had happened to the old Mercedes, only that one time dad had tried to buy it back, but it was too much money.Twenty years went by. I had always driven Porsches, but I finally bought a Mercedes Benz in 1988. Upon asking around for a mechanic, everyone recommended Rene at Van Nuys Sportscar. Rene owns several Mercedes, including a Gullwing. I told him that my dad once had a race car that had been a Gullwing. One day I came in, and Rene showed me an article in the Gullwing Newsletter which was about my Dad’s car. I noticed that Lyn Yeakel, an old friend of my dad’s, was a newsletter staffer. 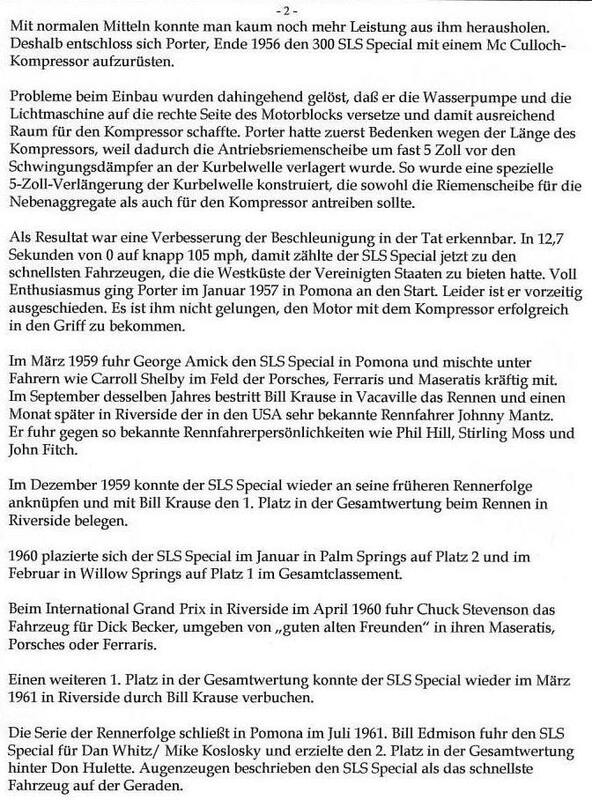 I contacted him, and he sent me some additional pictures and information about my dad’s race car which I didn’t have. Some months ago, Rene mentioned to me that he knew of someone who actually had the race car, named Scott Grunfor, and gave me his number. 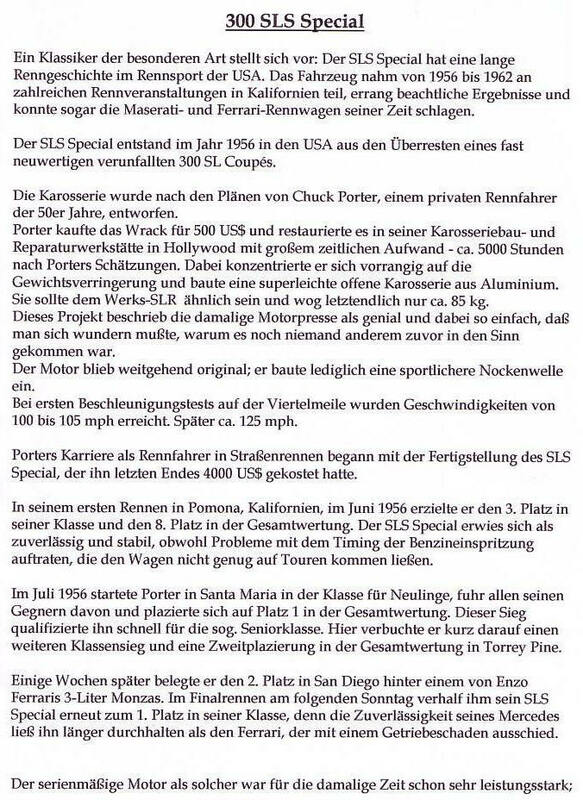 This was a shock to me, and very emotional, as I had no idea that the car was still in existence after all this time.I contacted Scott, who had indeed just sold the car to a collector in Germany who would probably be contacting me to know more about the car. I wondered what it looked like by now. What condition was it in? 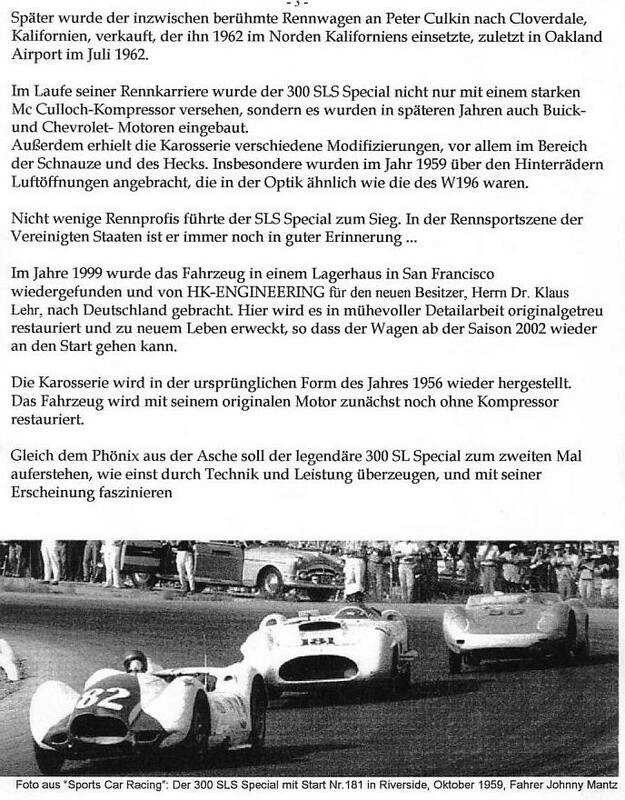 I didn’t hear anything more about the car for awhile, but I was happy just to know that a part of my father’s legacy was still around.In July of this year, just prior to the Historic Races in Laguna Seca, Scott contacted me to tell me that the owner of the Mercedes would most likely be bringing the car here to race it in Monterey. I begged him to please let me know, as my sister and I would come to Monterey from Los Angeles to see it.As the race day grew closer, Scott gave me the number of Hans Kleissl, who had found the car. Hans loved the car and it’s history, and told Klaus Lehr about it. Klaus agreed he would like to own it, and the restoration began. I saw a picture of it how Hans found it. Man, was it ugly! As the race weekend approached, my sister and I apprehensively boarded separate planes to Monterey; her’s in Ontario, CA, mine in Burbank. We met at the San Jose airport where I had rented a car. Driving to the race track we got stuck in traffic and were worried we would miss the race. We made it in time. Hans met us at the giant GoodYear sign in the middle of the paddock and we walked together to where the race car was parked. There it was. Just as I remembered it 44 years ago. Something that my father designed, hand-crafted, perfected; and the car is timeless. Hans had perfectly restored it. He felt something special about the car. I wonder if he knows how special it is to me? Do you believe in fate? They actually love the car as much as I do (well, almost!) Klaus brought the car here to California, all the way from Germany for it’s first race because this is where it was famous. Thank God, or I wouldn’t have had the priviledge of seeing it and actually sitting in it! The resurfacing of the Mercedes is an answer to one of my prayers. What if I had chosen another mechanic? Or bought another Porsche?